Home » French Polynesia: Daily life scenes of today and yesteryear. » French Polynesia: Daily life scenes of today and yesteryear. French Polynesia: Daily life scenes of today and yesteryear. The Quinn's Bar was established in the 1940s, and was one of the most famous night clubs in the vast Pacific Ocean. It was known to every seaman and they were so enthusiastic when talking to visitors about it that the latter would rush into the club as soon as they had set foot on Papeete quays. It was the dance-bar which reflected the most the image of traditional Tahitian partying. 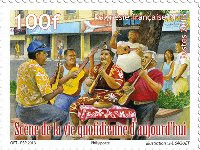 The local music bands and orchestras which performed there enjoyed a reputation that extended way beyond the borders of Tahiti. The local beer flowed in abundance and bouncers were busy evicting noisy and agitated party-goers through one of the saloon doors. But they would soon come back through another door. Only very few girls had not performed frenzy dancing in this Mecca of joie-de-vivre. Some mamas, who were absolute Quinn's addicts, sometimes even had to hide themselves from their relatives when going out. A local bus was parked outside that folkloric Tahitian Hut until midnight to carry late party-goers to the "Lafayette", another famous "house of sin" on the East coast of Tahiti, which was then open until dawn. The Quinn's Bar was closed in 1973 due to unsanitary conditions and did not reopen. But like the Mariachis in Mexico, there are many little bands that now bring some life into some corners of the capital city. Etiquetas: French Polynesia: Daily life scenes of today and yesteryear.